In Unusual Attitudes, Martha Lunken has collected her favorite columns from Flying Magazine to share with a wider audience. The stories chronicle Martha’s rich life in aviation and are peppered with an assortment of unforgettable aviation characters. Often funny, sometimes irreverent, always personal, the stories in Unusual Attitudes will resonate with everyone who loves airplanes. 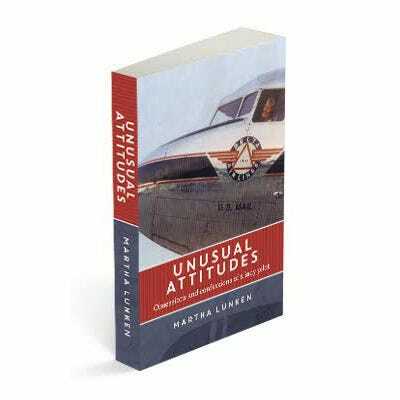 Filled with Martha’s adventures and misadventures, Unusual Attitudes enables readers to accompany her as she flies a variety of popular and not-so-popular aircraft. From her tales as an FAA examiner to her experience operating Miss Martha’s Flying School to unforgettable flights with whom Martha calls her “forever friends” in aviation, she shares it all with you. Interspersed with the stories is some real-life advice from Martha, valuable to those who interact with flight instructors, the FAA, and other airplane owners and pilots. Her opinions may anger you; these stories may make you laugh or cry, but each chapter of Unusual Attitudes is filled with the passion that Martha brings to her flying. Whether you read the chapters in order or skip around for a favorite, readers will always be entertained as Martha spins another tale and draws you into her aviation life. 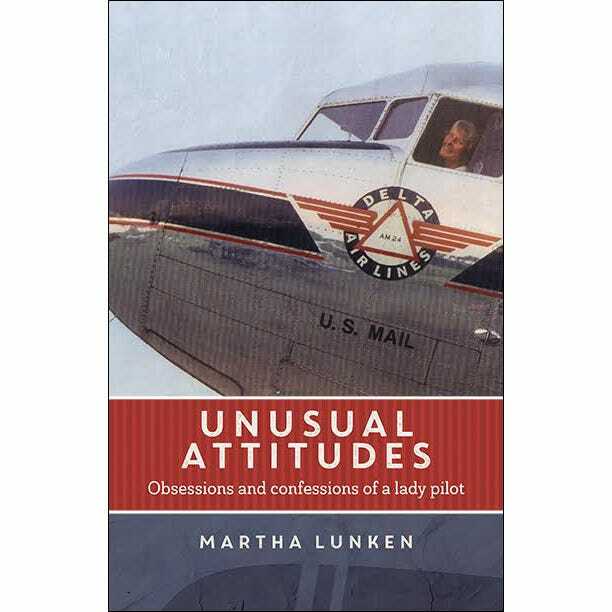 Unusual Attitudes shows why Martha Lunken is one of aviation’s most popular columnists, sure to be appreciated by those who enjoy reading, and re-reading, a great airplane story. Approximately 285 pages, including 8-page color photo section. Martha Lunken fell in love with airplanes and age 9 and has been telling stories about them ever since. In her long love affair with flying, she has been a flight instructor, owned a flight school, owned a variety of airplanes and worked for the FAA in Chicago and Cincinnati. She has an ATP, airplane single and multi-engine land and sea, and a commercial hot air balloon rating. She's type rated in the Lockheed 18, DC-3 and SA-227 aircraft. Martha’s honesty and humor, along with her willingness to call ‘em as she sees ‘em have garnered the devotion of Martha fans worldwide. Martha is witty writer with a wealth of interesting experiences, a dynamite combination. I keep imagining how much fun it would be to split a bottle of wine with her. Highly recommended. Martha seems like part of the family! Literally got here in a day, too. Superb service. Thanks! This was a great read about an old aviation non-politically correct female pilot. The bottom line is Martha Lunken loves aviation as much as we do. It is fun to read of the mischief she has gotten into and her descriptions of some imperfect colorful early avaitors including the founder of Sportys. Though she pretends to dislike some people or institutions, the worse thing she ever writes is the equivalent of "Just not my cup of tea." She is never hesitant to describe her own faults and embarrassments which makes this a fun read. Also interesting is her take on old aviation such as flying DC-3s, working for the FAA, and dealing with occasional tragedies. I loved this book and think you will too. I received the book in good time and was very well packed. I just started reading the book but have been enjoying Martha Lunken column in Flying Magazine for a few years. Martha Lunken is a classic. A one of a kind. Worthy of what Reader's Digest used to call 'My Most Unforgettable Character', or something like that. Equal parts comedy, aviation education, and history, this book will amuse and is also a great gift. Buy it. Pass it around. Enjoyed every story. Truth, better than fiction. Product is fine. Shipping $ is ridiculous! Shipping costs are crazy! They can put any book in a Padded Flat Rate envelope for $5.85. They charged $18 for 3 day shipping. Just insane! They'll probably take down this post because they don't want you to see it. Everything I hoped for, and more! Recently received a signed copy of this great book and haven't been able to put the book down. Just like her column in Flying Magazine, Martha Lunken's authentic writing draws you in as she describes her aviation adventures and exploits. She clearly has a love for general aviation and flying in general. She is one of the greats of our aviation family and I'm very happy to own a signed copy of this remarkable book. Well, she tells it like it is. Her experience powered by her attitude complimented by her honesty is a tribute to the lady and not only a joy to read but a good primer on flying. Is this entirely new material, or is it sourced from her column in flying magazine? BEST ANSWER: It's a collection of her columns from "Flying" magazine. I'm pretty sure there's no new material but not 100% positive. Can you elaborate? Is this new material or recycled from old columns? DO THEY HAVE AUTOGRAPHED COPIES, OR HARDCOVER? BEST ANSWER: Only paperback is available. We offered autographs for the first month of release, but those are no longer available.